Were there really "two" Councils? 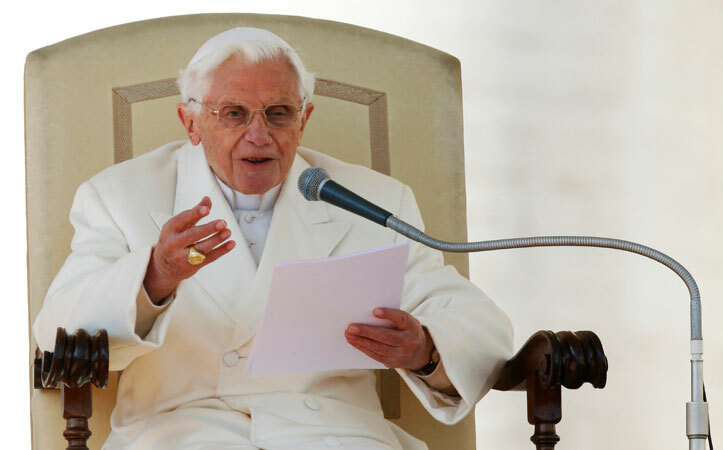 "Welcome to the Vatican, which we are pleased to note, is becoming well-known to a large number of you. For the Pope, audiences follow one after the other. But he cannot hide the very special joy which he feels in spending some time with the journalists and the reporters for radio and television. And we are happy to express our gratitude to editors of newspapers and directors of radio stations, who have assigned to Rome to cover these council meetings so many reporters in whom we are pleased to recognize both high quality and professional competence. We have already had occasion to tell you of the esteem we hold for journalists, and how aware we are of the importance they occupy in the world of today, with their tremendous power over public opinion. Theirs is a choice place. And you know that the honor of your profession demands, on your part, objective reporting and constant concern for the truth. ... There could be the temptation to search out certain well-known “fiends”: nationalism, conflicting tendencies, parties, as well as historical and geographical differences, such as between East and West. If attention is limited to these externals or if it undertakes to emphasize them, then the reality of things is altered, even falsified. For all the bishops are endeavoring to avoid giving any substance to these divisions, in order on the contrary to be guided by the objective divine truth which they profess and by the fraternal charity which animates them. Yes, the Church, as she appears before you cannot fail to make you reflect and — herein is its apologetical force — lead you to Him from whom she draws her very life: Christ, the invisible Head of the Church assembled in council." and chatted with them about the Second Vatican Council, "as I saw it..."
He spoke of a "council of the media", which at the time may have been stronger than "the real Council." "For today, given the conditions of my age, I could not prepare a great, real address, as one might expect, but rather I thought of chatting about the Second Vatican Council, as I saw it..."
"We went to the Council not only with joy, but with enthusiasm. The expectation was incredible. We hoped that everything would be renewed, that a new Pentecost really would come, a new era of the Church, because the Church was not robust enough at that time: the Sunday practice was still good, even vocations to the priesthood and religious life were already somewhat fewer, but still sufficient. But nevertheless, there was the feeling that the Church was going on, but getting smaller, that somehow it seemed like a reality of the past and not the bearer of the future. And now, we hoped that this relationship would be renewed, changed, that the Church would once again source of strength for today and tomorrow. " "Everyone arrived with great expectations; there had never been a Council of this size, but not everyone knew how to make it work. " "It appeared to many as a struggle for power, and maybe someone did think about power, but basically it was not about power, but the complementarity of the factors and the completeness of the body of the Church with the bishops, the successors the apostles as bearers, and each of them is a pillar of the Church together with this great body”. "... Yet, there was the Council of the Fathers - the true Council - but there was also the Council of the media. It was almost a Council in and of itself, and the world perceived the Council through them, through the media. So the immediate Council that got thorough to the people, was that of the media, not that of the Fathers. And while the Council of the Fathers evolved within the faith, it was a Council of the faith that sought the intellectus, that sought to understand and try to understand the signs of God at that moment, that tried to meet the challenge of God in this time to find the words for today and tomorrow. So while the whole council - as I said - moved within the faith, as fides quaerens intellectum, the Council of journalists did not, naturally, take place within the world of faith but within the categories of the media of today, that is outside of the faith, with different hermeneutics. It was a hermeneutic of politics. The media saw the Council as a political struggle, a struggle for power between different currents within the Church. It was obvious that the media would take the side of whatever faction best suited their world. There were those who sought a decentralization of the Church, power for the bishops and then, through the Word for the "people of God", the power of the people, the laity. There was this triple issue: the power of the Pope, then transferred to the power of the bishops and then the power of all ... popular sovereignty..."
"And we know that this Council of the media was accessible to all. So, dominant, more efficient, this Council created many calamities, so many problems, so much misery, in reality: seminaries closed, convents closed liturgy trivialized ... and the true Council has struggled to materialize, to be realized: the virtual Council was stronger than the real Council. But the real strength of the Council was present and slowly it has emerged and is becoming the real power which is also true reform, true renewal of the Church." "It seems to me that 50 years after the Council, we see how this Virtual Council is breaking down, getting lost and the true Council is emerging with all its spiritual strength. And it is our task, in this Year of Faith, starting from this Year of Faith, to work so that the true Council with the power of the Holy Spirit is realized and Church is really renewed. We hope that the Lord will help us. I, retired in prayer, will always be with you, and together we will move ahead with the Lord in certainty. The Lord is victorious."